This takes longer than most people want to spend on rusty weapons, however you can stop at any stage you want and next to the face the weapon and hands are the most important parts of a miniature. The eye is naturally drawn to these three places, it is known to some as the triangle theory. Over the last few years I’ve been trying to up my Nurgle game by working on making my weapons look even more rusted and the key is lots of washes and using pigments. 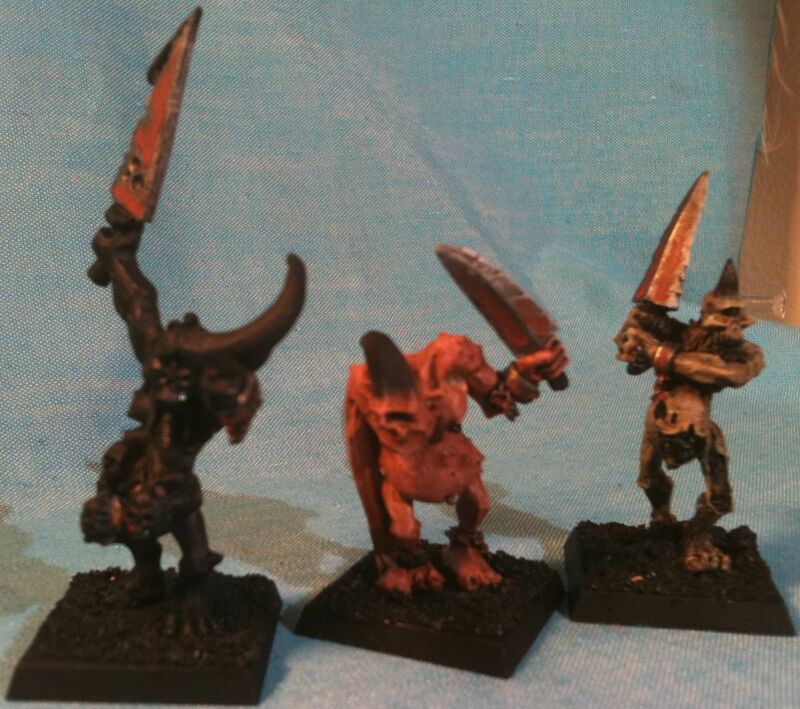 The first step for these Plaguebearers was to get a nice dark base metallic. This was done by painting the swords (and everything else metal) with GW’s Boltgun metal. Then I applied a wash of Badab Black. 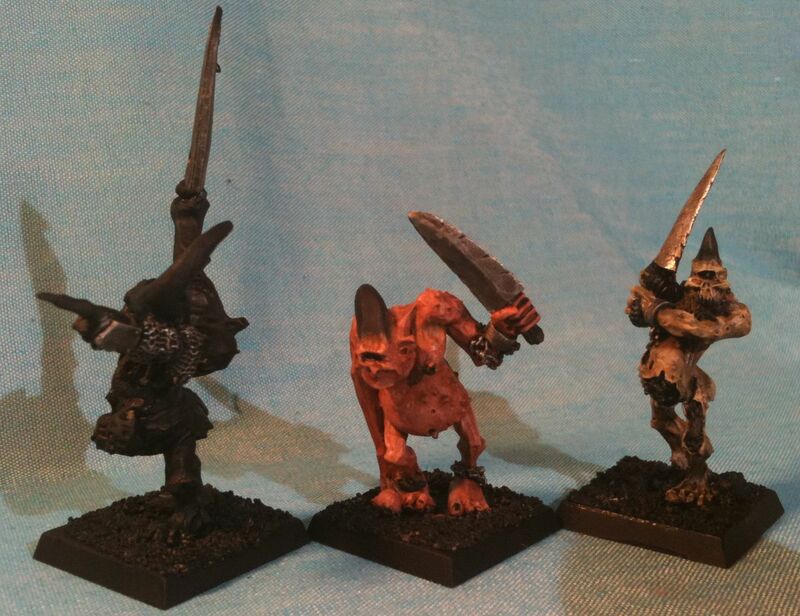 When that was dry I used an old partially dried out pot of GW’s Chainmail and painted on some simple highlights. Then and this is the key to darkening the metal I did another wash, this time I used Devlan Mud. The black wash was layered on everything, but starting with the Devlan Mud you have to be more strategic where you put your wash, basically you don’t want to obscure your highlights. Normally when painting rust on a building or a vehicle it is pretty obvious where the rust should go and it likely flows down… I’m painting Nurgle Daemons and they are not known for following the laws of physics so you can put rust wherever you want, but it still should flow from dark to more intense and this is the technique I used to achieve the effect. Starting with the nice dark metallic I got out my trusty old GW Rust Brown Ink. I thinned this with a couple drops of water and applied it where I wanted rust. This was basically my entire old rust technique and it looks alright, but if you want really intense rust you’re going to have add more layers. Now their are a lot of experts online who will tell you to put flow aid or future floor wax in your washes and that you want to break the surface tension so the wash doesn’t dry with a ring shape. That is not the technique you want to use here. You want the rust washes to be watery and you want to paint it on in little blobs and to drag it towards where you want the more intense rust. If it dries with little rings that is fine, because that is how rusty water dries. You can mix all your additional rust washes separately but I generally just build up from where I am to where I want to be. This has it’s risks but as long as you continue to add fresh clean water along with keeping your ingredients reasonably proportional you’ll get the results shown on this page. The next thing I added to my rust wash besides two drops of water was some “Rusty Red” pigment I got this in a set of 12 black lidded pigment pots I ordered online. I can’t remember the name of the manufacture, something like Tim or Steve. (Bruce from Hirst Arts recommended them I think, yep!) They are called Doc O’Brien’s and you can order them here. Swirl around your new rust wash and then put it on in little globs where you want the rust to be more intense, remember it should generally flow with gravity. When that wash is completely dry on the figure add a couple drops to the remnants of your rust wash on your palette and get some Foundation Orange, this is made by GW and is really good thinned down as a rust wash. Of course I like to go too far so I added another pigment, this time “Rust 2” from AwesomePaintJob.com. 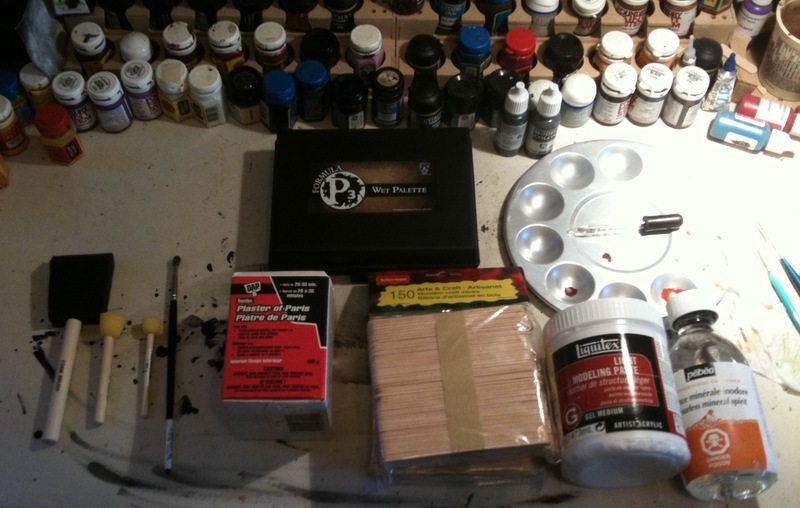 (The store seems to be down, but the blog is up…) You can use any pigments you want, but the idea is to add lighter, brighter pigment to the wash as you work towards a more intense rust color. Again apply in little globs each time successively smaller as you work towards the most intense rusty point. Again waiting for the mixture to dry, it doesn’t take that long, but it is a necessary delay. I was only rusting up three swords, a couple chains and a pendant, but if your rusting a vehicle, a building, or an entire squad it might seem like you’re waiting less. 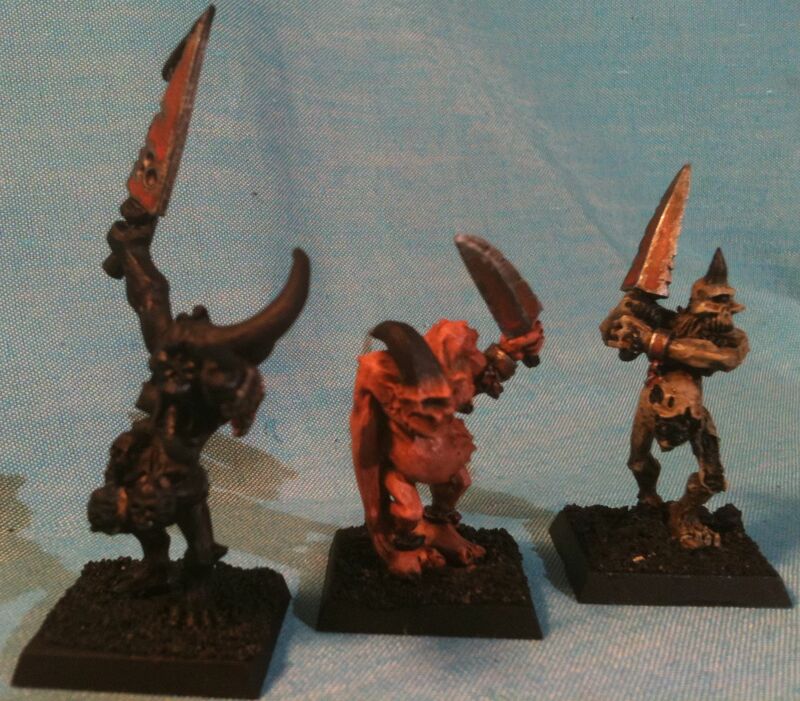 Make sure you mix enough of each rust wash as you will have trouble matching your magic mixture. Of course rust can be anyway you want it. To my existing rust wash I added a bit more clean water and some GW Fiery Orange which is what GW advocates you use to make rust washes now-a-days. I learned the technique from White Dwarf. I also added some more pigment, this time “Rust 1” from AwesomePaintJob.com. This is my brightest and most intense rust of the whole shebang. You could make an even brighter more intense rust colour if you started anew without the previous darker ingredients. I just do it this way as I only have so many little cups on my palette. After applying little globs of more intense rust wash and letting it dry I again took photos and we’re onto the final stage. 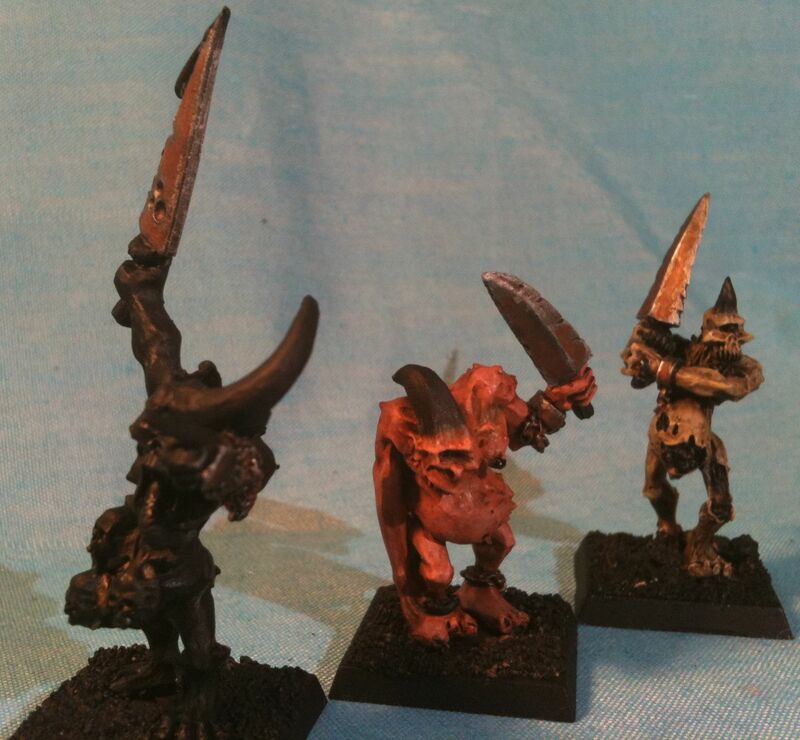 I painted edge highlights where I thought they would fall or look most dramatic with GW Mithral Silver. If it looks a little too much, remember a lot of light is on the minis in the photos. You can see how the more orange I added to my rust wash, the more it came to look like my supposedly flesh coloured Plaguebearer. 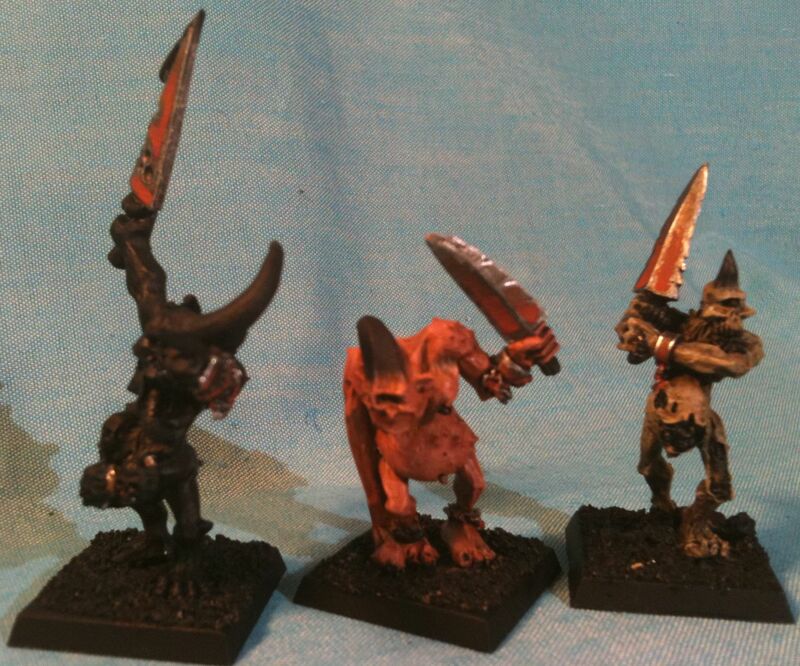 Damn crappy old GW Flesh Wash.
Well there you go, perfectly good rusty weapons. Next for me is a few black touchups of the unit champion and doing his skin, but that may wait until tomorrow. Today it seems hotter in the evening in Vancouver as my palms are sweating typing and painting which isn’t good. 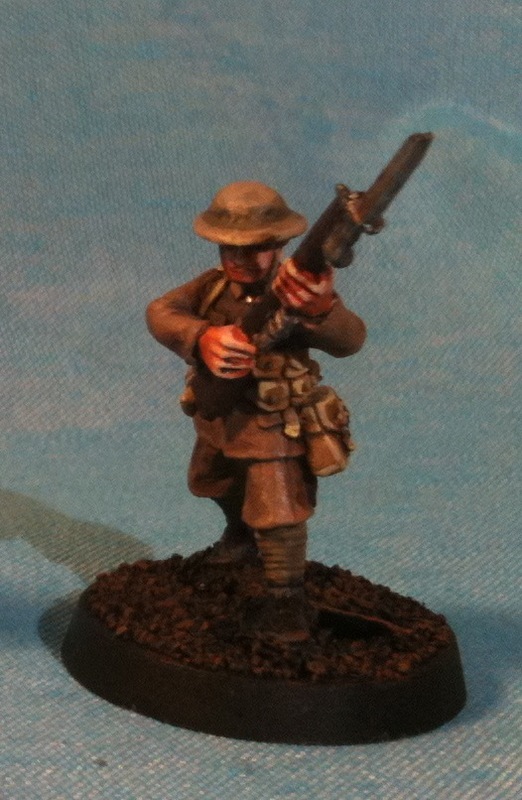 As promised I stayed up in the heat and finished my WW1 Foundry Rifleman test model, which I painted in the colours of the Canadian Corps circa mid to late 1916. 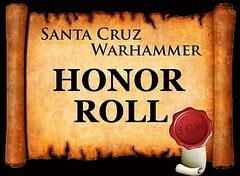 Furthermore I made the miniature a member of the Van Doos, but I almost forgot to paint distinctive shoulder markings. This is the final of four blog postings about painting this model. It was painted beside the original test model, and another test model this one for my Servants of Decay army which I’ll be doing for next years Astronomi-con Vancouver. 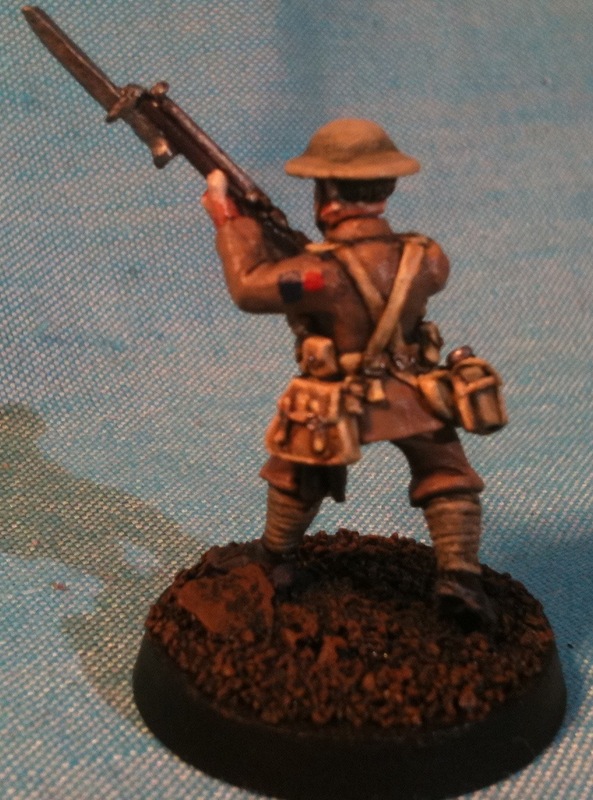 But the focus of this post is how I did my second and better but still not perfect Canadian WW1 infantry soldier. Clean, base and prime the model. I used Citadel spray black primer, but any black paint that is of reasonable quality will do. Uniform is painted Foundry British Uniform Brown Triad (#100) order A-B-C, with a Devlan Mud wash, after the wash was an edge highlight of 100C. 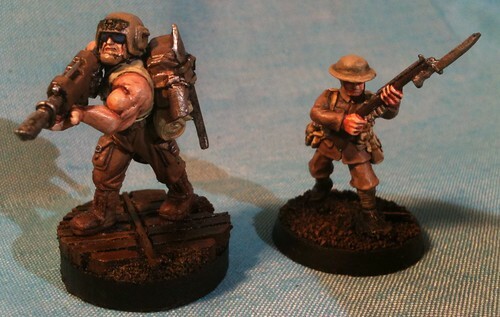 Rifle stock and entrenching tools any dark brown, I used GW Scorched Brown. Weapons and canteen lid painted Boltgun Metal, washed with thinned armour wash, highlighted with Chainmail and selectively aged with Gryphonne Sepia. Flesh was Foundry Triad Flesh Triad (#5) order B-A-C, then a custom flesh wash made from red and brown ink, I used old GW inks Rust Brown and Plasma Red. Finally another highlight of Flesh 5C. Then I painted the rest of the gear which was the helmet, canteen, and ‘putties’ using Foundry Triad Drab (#12) in the order of A-B-C. I then highlighted the black boots with Foundry Triad Charcoal Black (#34) with order B-C-A. Then I used a tiny bit of Badab Black wash on the ‘putties’ and on the boots, this was very selective and subtle. 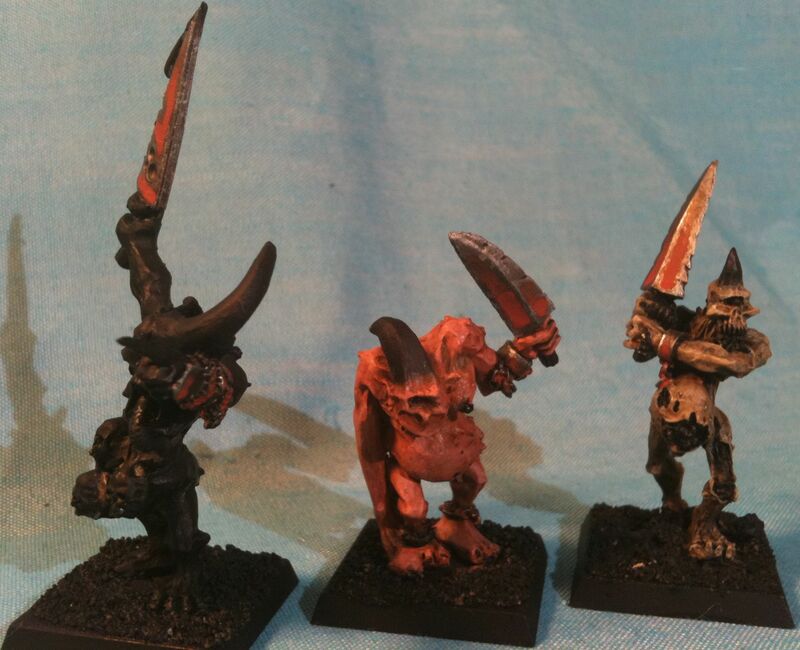 I did the eyeballs of the model, little bit of white paint, even less a dot of black paint, fix up any flesh with 5A. Finally I drybrushed the beach sand on the base with three GW Browns: Bestial, Snakebite Leather, and Bubonic. Fixed up the rim of the base with Chaos Black paint. Painted the insignia, a blue rectangle with a red circle above it on both shoulders. I decided to use Deadly Nightshade (old GW paint) and for the red I’ll go with GW Blood Red. That’s it, I recommend sealing your model the next morning when it is good and dry with a Matte Sealant. I may use Purity Seal, I may use Krylon, but I’ve read and been told that Testors Dullcoate is the best. If you’re going to paint a platoon of these guys you can try to cut corners, use only part of the Triads, the Foundry Drab Triad all three colours are quite different but if you have faith, thin your paint, and feather in a bit… Anyway experiment with the triads, try just the B with the C as a highlight or maybe the A with a B highlight, try leaving out some of the washes, use just one metal colour etc. etc. I also used the P3 Wet Palette for most of these colours which ensure you thin your paint at least, but maybe it is too much. It definitely isn’t necessary I’ve painted 100’s of minis without one. I don’t use my metallics in the wet palette, I’m worried about contamination. Now to take the final pictures and then try to get some sleep.